Before I was married I had no clue what hominy was. Yes, I knew it was some sort of food, but besides that, I was clueless about it. I think growing up in the 1970’s and 80’s in Oregon might have something to do with that. Oregon is pretty culturally diverse when it comes to food, unless it is southern style food. Things like grits, hominy, okra, and biscuits and gravy were not a part our everyday food. I was pretty clueless on what southern food was. Over the years though I have learned to cook and like more and more of these dishes. I can now say I like most of these things. Well, besides okra, I could write a whole post on the first time I ate okra. I think the northwest girl part of me will always dislike okra, but grits, hominy, and biscuits and gravy are now actually things I enjoy. I was first served hominy at my inlaws. My mother inlaw served it like you would corn. It was heated with a little salt and butter. It was good this way, but I thought you could easily do much more with it. So, I started looking for other ways to serve it. Over the years I have seen and made many recipes for hominy type casseroles and dishes. I adapted one of my favorites for the crockpot. I like the crockpot version because the flavors really blend together well when cooked for several hours. I also like this because it is an easy dish to take somewhere. I have taken this version to quite a few church dinners over the years because it is so simple to prepare and everyone enjoys it. Do you like hominy? If so how do you serve it? Fry onion in about 1 tablespoon of oil until tender. Combine cooked onion and remaining ingredients and place into crockpot and cook on low for 2-3 hours. This post linked to What’s In Your Crockpot. Thanks for posting – I never knew what it was! Sounds really good though – may have to give it a try! Looks yummy too. I just tried hominy for the first time this summer (yes, I am a Yankee now living in northern VA). I love it! My favorite is to put it in soup – delicious in white chicken chili! Will have to try this, thanks! Umm this looks good Lynn. I love hominy and this is a new way to prepare it. This sounds good! My husband isn’t a huge fan of hominy (and he’s from the south!) but I think he would change his mind if I fixed it this way. Thanks! 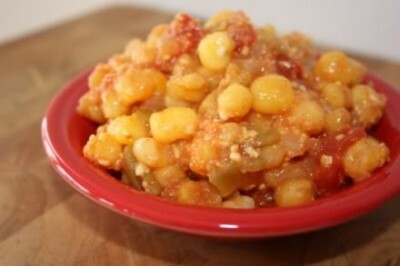 I’ve never had hominy – its not a common dish here, but it sounds great! Especially with all of those flavours =D. I LOVE hominy. I’ll have to try this. My favorite way is to heat and eat straight from the can with a dash of Tabasco Sauce. This looks good. I have to admit I do not have fond memories of hominy as a child, but that’s probably because it was always served straight out of the can. I’ll have to give this a try! .-= Kara´s last blog ..Frugal Master Bath Makeover- Update Knobs =-. I LOVE hominy and haven’t had it for years. I’m so excited to try this recipe as I love everything in it. If I only have the larger oval crockpot do I need to double the recipe or cut the cooking time somehow or cook on a different heat setting? Thanks for sharing! I probably would do one or the other. It might work fine to just adjust the cooking time, but that may depend on how hot your crock pot cooks. Thanks for your reply. I’m actually a total novice when it comes to cooking and have used my crockpot less than a handful of times in the almost 5 years since I got it so I’m not sure how hot it cooks, but it does have a low setting from what I remember when I unpacked it almost 2 years ago when we moved to the house we’re renting now. I guess I’ll double it and hope for the best…lol. Thanks again!